A kitchen should be a place where good food is cooked and served. But not always is it that a kitchen is comfortable. It is important to make sure that all the tools and types of equipment are of right size and quality as they define the quality of your food in one way or the other. There is a long checklist of tools including the ladles, locking tongs, chefs knife, microplane grater, measuring cups, rotary beaters, blenders, potato mashers, mixer, cooking rack, juicer, and many other kitchen equipments which are a must for a comfortable cooking. And adding to this list comes a very important equipment i.e. the food processor. These come in very handy for the prep task and can effortlessly do the tasks of the other equipments. This can blend, grate, chop, and mix everything and anything. This all in one appliance can help you in saving up a lot and will work like a charm for your cooking needs. A food processor is usually available in multiple sizes in accordance with the work. These fit a chef’s kitchen perfectly as there is a lot of large scale cooking involved and also works great in your home kitchen tops for a meal of few. The best things being that both the types perform the same function exclusive of their sizes. Let us learn more in detail about the work of these food processors. A food processor comes with an S-shaped blade which is fully devoted to the function of chopping. All you need to do is put in some food item which needs chopping and turn it on, and here you have smallest and finest of chopped vegetables. Added to this, you can even manage the size of the food item by managing the time you keep the processor on. The best items to chop in a food processor are nuts, herbs, onions, and tomatoes. Also, the blades are extremely strong and can even grind any kind of meat. A food processor comes with multiple blades which assist you with different thicknesses of food slicing. One can slice almost anything including a carrot, eggplant, zucchini, cucumbers, and more with precision. It is also grate for slicing up food items for pies and baking purposes. Grating is a task in itself and one needs to be very careful while doing it manually. But now with the use of a food processor, one can easily grate a block of cheese, carrots, potatoes, and every item without hurting their fingertips and of course it even saves up time and energy. Food processors are great for pureeing purposes. Be it chickpeas or tomatoes, they work for all and with great efficiency. Also, the best things being they don’t lump your puree like other puree tools do and make your sauces and hummus smooth. Just keep in mind that don’t overfill the processor as it might start leaking and then cause an unwanted mess. A food processor is wonderful for the preparation of a dough. The S blade isn’t only for slicing but also used for preparing those delicious pie crusts that we all love. Also, many of the best food processors come with a separate dough blade for a perfect kneading purpose. Now let us talk about the actual question i.e. the trick to choosing the right processor. It is a must to buy a food processor which equips you to work with comfort. It should have a small tube on top that enables you to add other ingredients with ease while switched on. Also, a pusher is of great use if you have to add in some large items without having any issues with the safety of your fingers. A pusher basically acts as a lid and prevents you from hurting yourself. Added to this, make sure that the food processor that you are opting for has a ‘pulse’ button for a sudden burst of power which comes in handy for rough chopping and also for fast kneading. A touchpad is of great use as it is easy to clean in comparison to raised buttons and is also dishwashing safe. A food processor needs to be extremely powerful for the most hectic jobs. These involve kneading stiffly, grating of frozen cheese, and for chopping hard items like potatoes and carrots. A powerful processor is a must for having a smooth processing job, if not so you might end up having un chopped items or variations. Or even you might have issues like a motor burn out. To give an example, it is important to opt for a 600 watts motor for a full-sized food processor. 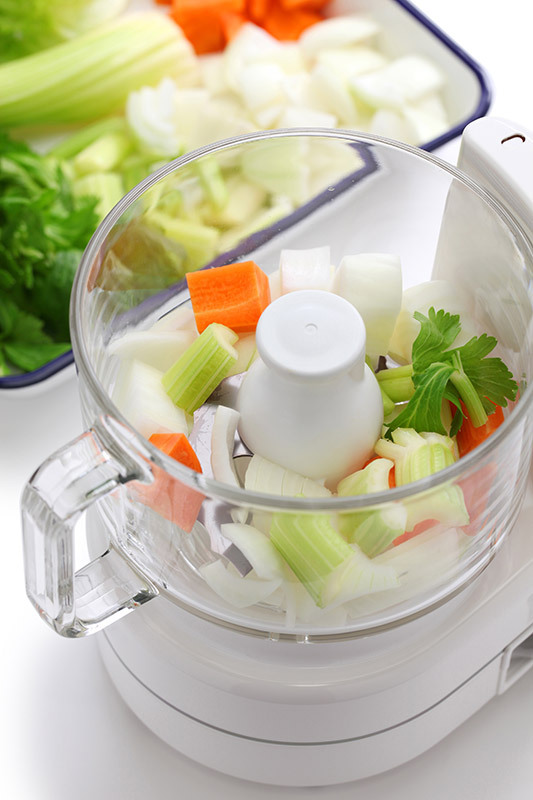 A food processor comes in different variations: 3 cups, 6 cups, 9 cups, 15 cups, and 20 cups. So depending upon your needs and the number of people you cook for an average. To give an example, if you are a family of 4 to 7 then an 11 cups food processor is great for you or if you are just using it for a minimal quantity of herbs and sauces then a 3 cup processor will work great for you. Many of the food processors come with an accessories kit which often includes blades, work bowls, slicing disks, graters, speed settings, and more. Always make sure that you analyse your needs and then opt for paying extra money for all these features as it is it might go waste. The multi-functionality of this tool makes it a must-have for every kitchen. However, please keep in mind the above factors when you choose a food processor for your home.